Remember as a child having that one place you could hide and feel secure when you were afraid? It may have been under the bed, or in the closet. Wherever it was, you knew without a shadow of a doubt all would be well if you could just get there. That is what worship, experiencing the presence of God, has become for me: a hiding place. As fear rears its ugly head I know that His presence is the one place I can run. While there, He comforts and reassures me that I am safe. 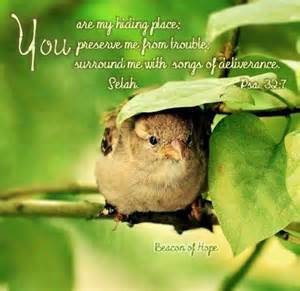 Allow the Lord an opportunity to become your hiding place today. Whisper a prayer, read about His promises in the book of Psalms, or listen to songs of praise that glorify God and His ability to work on your behalf. Allow Him an opportunity to reassure you and provide the answers you need. Most of all, allow His love to overshadow you. Father, wrap us in your arms today, and hide us as the storms of life rage round about us. Reassure us that we are the apples of your eye and that you will never leave us nor forsake us. In Jesus’ name we pray, amen. When you are feeling frenzied today, before running to others for answers and comfort, consult the Lord. How has the Lord revealed Himself to you as a place of shelter in your daily life? Previous Post Just in case you forgot..